How Diseases are Emerging and Re-Emerging? Fifty years ago people believed that the war of humankind against the infectious diseases was virtually over and science had won over infectious diseases such as pneumonia, whooping cough, polio and smallpox with the help of antibiotics, vaccines, and some aggressive public health campaigns. But, after the 1980’s, the belief was gone forever because in last 30 years, at least, a dozen new diseases have been identified and traditional diseases that appeared to be gone are re-emerging. In these years, the world has seen the global spread of AIDS, the resurgence of Tuberculosis, and the appearance of new enemies like hantavirus pulmonary syndrome, hepatitis C and E, Ebola virus, Lyme disease, etc. Hence, it is now clear that the war is not over as infectious diseases are still the leading cause of deaths globally. What are Emerging Infectious Diseases? Have not occurred in humans before (this type of emergence is rare). Figure: List of Emerging Diseases. So, we can conclude that the emerging diseases are the diseases caused by some newly identified and previously unknown infectious agents that cause public health problems either locally or internationally. 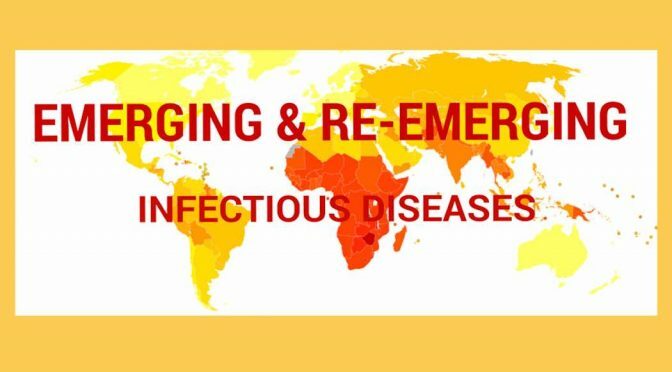 What are Re-emerging Infectious Diseases? Figure: List of Re-emerging Diseases. What are factors contributing to the emergence of diseases? The humans are doing deforestation on a very large scale and which has forced animals to come closer to human habitats. This displacement has increased the possibility for pathogenic agents to breach species barrier between animals and humans. For example, Lyme disease, Hantavirus Pulmonary Syndrome (HPS), Lassa fever all emerged when humans began encountering the arachnid vector (For Lyme disease) or rodent host (for HPS and Lassa fever) of the causative agents in greater number than ever before. Global Warming is also indirectly responsible for the outbreak of diseases. This is because global warming leads to unwanted and unpredictable climatic changes such as floods, tsunami, cyclones etc. and which in turns helps in the speedy transmission of disease such as malaria, dengue, cholera etc. Urbanization often crowds humans and increases exposure to microbes. Crowding of the population leads to unsanitary conditions and hinders the effective implementation of adequate medical care, enabling more widespread transmission and propagation of pathogens. For example, the re-emergence of diseases such as Diphtheria and whooping cough (Pertussis) is related to inadequate vaccination of the population. For example, the re-emergence of diseases such as Diphtheria and whooping cough (Pertussis) is related to inadequate vaccination of the population. Land Development and the exploration or destruction of natural habitats have increased the likelihood of human exposure to new pathogens and may put selective pressure on pathogens to adapt to new hosts and changing environments. For example, the spread of Lyme diseases in New England probably was due to the ecological distribution that eliminated predators of deer. An increase in the deer population and deer tick populations provided a favorable situation for pathogens to spread among humans. The Globalization of food processing and supply centers, which include handling, cutting, refrigeration, and other treatments has created the potential for widespread outbreaks of foodborne microbial diseases. For example, the emergence of disease such as hemolytic uremic syndrome was related to consumption of raw or uncooked beef and unpasteurized apple juice. The unnatural and unprotected sexual practices have also created a higher risk of getting infected with sexually transmitted diseases(STDs). For example, diseases like AIDS (Acquired Immune Deficiency Syndrome), Gonorrhea and Syphilis. The key factor responsible for the rise in drug-resistant pathogens has been the excessive or inappropriate use of antimicrobial drugs or therapy and sometimes the indiscriminate use of broad-spectrum antibiotics. For example, Tuberculosis has re-emerged due to the evolution of the causative bacteria. The pathogen has acquired resistance to the antibiotics used to treat Tuberculosis (either through mutation or genetic exchange). Immunosuppression, either by another disease agent such as the AIDS virus or by drugs taken upon organ transplantation, increases the number of individuals susceptible to new pathogens. (US), National, and Biological Study. ‘Understanding Emerging And Re-Emerging Infectious Diseases’. National Institutes of Health (US) (2007): n. pag. Web. 3 Oct. 2015. Previous PostWhy Nature Preferred DNA over RNA?Next PostHow do Bacteria become Resistant to Antibiotics?